We consider it as our esteemed privilege to become part of your focused efforts towards protection of the environment and saving the planet. As understood, our region, nation and planet confront two major threats of pollution and hunger. The rise in pollution levels means a rise in global temperatures. The Paris Climate Change Conference COP 21 or CMP 11 aims to limit global warming well below 2°C. Instead, the global temperatures continue to rise by 1.6°C. Since 1994, Pragati has envisaged Vruksho Rakshita Rakshitaha and Gow Samrakshana. By protecting the vanamoolikas (sacred medicinal and herbal plants) and heritage cows the two global threats of environmental pollution and hunger can be overcome. Our nation's dasa and disha are determined only by following Pragati Padam. Trees are the life-lines of mankind. 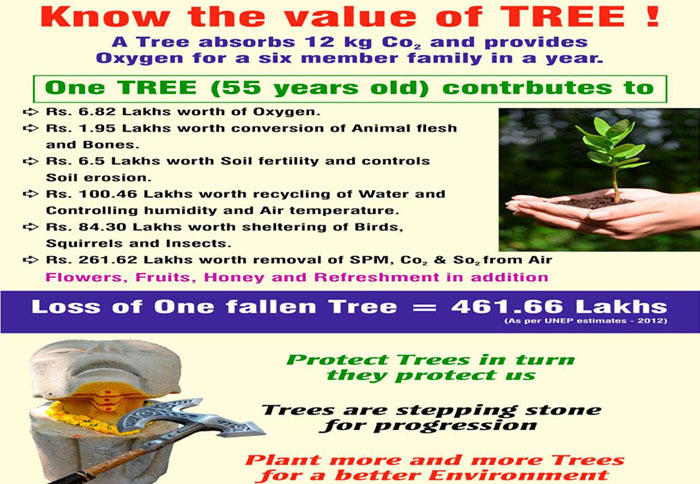 It is estimated that, a 55-year old tree is worth Rs. 5.6 Cr. A tree provides oxygen, improves air quality, ameliorates the climate, conserves water, preserves soil, and supports wildlife. Trees control climate by moderating the effects of the sun, rain and wind. Leaves absorb and filter the sun's radiant energy, keeping things cool in summer. Unfortunately, the nation's modernization and economic development initiatives have come at the cost of cutting down trees to build houses, clear paths for rail and road, provide firewood and supply wood to small scale industry. This could have been avoided by transplanting trees to natural zones, biodiversity parks and forest reserves. In India, the lack of know-how or technology concerning tree transplantation has been a major hurdle to realize transplantation of trees. For thousands of years India has espoused the precious secret of health and healing. The nucleus of an organization was born in 1999 consumed by the passion to ensure India's medical heritage must take its rightful place as one of world's greatest healing system. Pragati Group thus ushered in 'Vyadi Rahita Samajam' by harnessing the health giving and healing power of plants. Pragati espouses the concept of "Live and Let Live" by promoting Indian sacred heritage herbal medicinal plants, the Vanamoolikalu and Aushadi mokkalu which are the Prana Pradatas and Aarogya Pradatas that usher a healthy, wealthy, and happy living for all. In the direction to protect the trees from being cut or uprooted, Pragati has taken-up the magnanimous task of giving a new lease of life to trees. This is made possible by following innovative techniques in transplanting trees from one location to another, in the region and anywhere in India. The benefits of this are huge as the tree wealth is preserved and inordinate role of trees in protecting the environment from pollution is established. 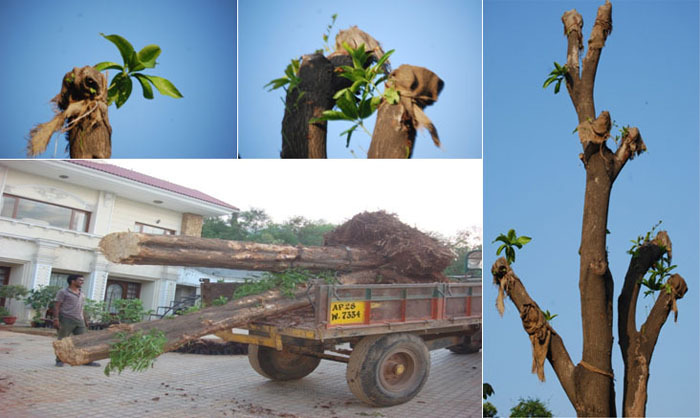 Pragati's journey in the direction of protection and preservation of trees through transplantation begun during a road widening at Chevella (road after Tippu Sultan's bridge) when a juvvi tree was uprooted and thrown on the fields. Dr G.B.K.Rao CMD Pragati Group requested the road contractor for lifting the juvvi tree with dead root stub and transport it to Pragati Biodiversity Knowledge Park. Within no time, the 90 year old juvvi tree bore new shoots. Since 1996, transplantation of all types of trees is a regular job at Pragati. We could graft at least 10000 plants from the 90 years old transplanted juvvi tree. Later a 15-year old mango tree was transplanted from one place to another within the Biodiversity Park. Central and State governments, Ministries and Departments, District and Local Bodies, public and private sector project personnel across India can avail our experience and expertise in transplantation of trees to designated locations, thereby help us to save trees and protect the environment. 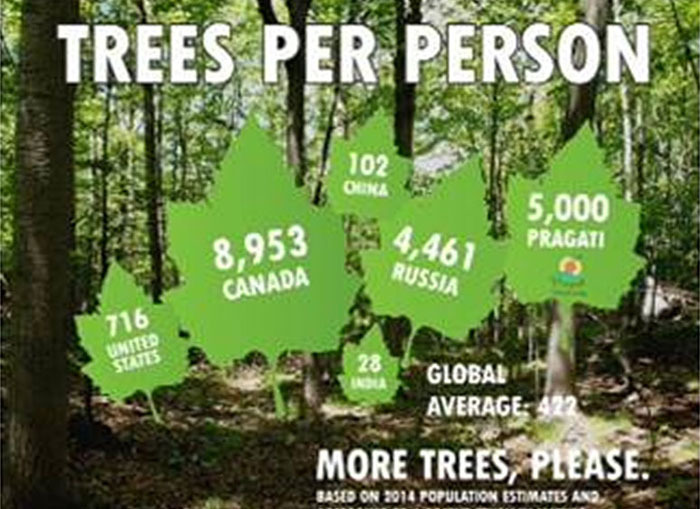 Pragati's focused efforts in transplanting trees have been recognized by different public and private agencies. The ISO 9001, ISO 14001, OHSAS 18001 and Organic certified Pragati Biodiversity Knowledge Park has created a zero pollution environment free from mosquitoes, bad bacteria and virus. As nature-green lovers, our combined efforts are sure to bring noticeable change for the trees and protection of the environment.